We are having a heat wave in Cincinnati, and my brain is just about fried. Temperatures range from the mid 70s (night) to the high 90s (day) and are expected to hang on for several days. I have been working on getting 4 paintings ready for the juried art show at the Clifton Art Center. I must submit the actual works next week. No photographs this time, I must deliver the artwork with labels for the judges to examine. The 4 paintings are all in acrylic paint, with one from The Envelope Collection - Level Playing Field Out The Window. Over the last 2 plus years, I have written about the political-economy and my belief in the need for a level playing field in order for our economy to run efficiently. In our economic system, the movement or flow of capital to those that wish to borrow from those that have funds to invest, permits the economy to grow and flourish. Whether it is a person buying a car or a corporation issuing a corporate bond issue, it is important that capital can flow to those that need or want to borrow. Credit ratings are a devise that permits the lender to assess the quality of the loan. Securitization permits many small loans, like mortgages, car loans and credit card debt to be bundled and sold in the capital markets to an assortment of investors. Pension funds, endowments, foundations, insurance companies and mutual funds can invest in securitized loans, and these bonds can then be bought and sold around the world. BUT, without credit ratings that have integrity, the movement of capital from lender to borrower is stymied. All I have been writing about, is our need to have a credit rating system that has no conflict of interest between the underwriters and the credit rating agencies. It can't be any simpler. The thing, in my opinion, that is holding back the growth of our economy and putting people back to work in the private sector, is the problem of confidence in the system of credit in our country. Our bond market is the world's bond market and while there is money out there looking for fixed income instruments to invest, no one wants to buy a pig in a poke. 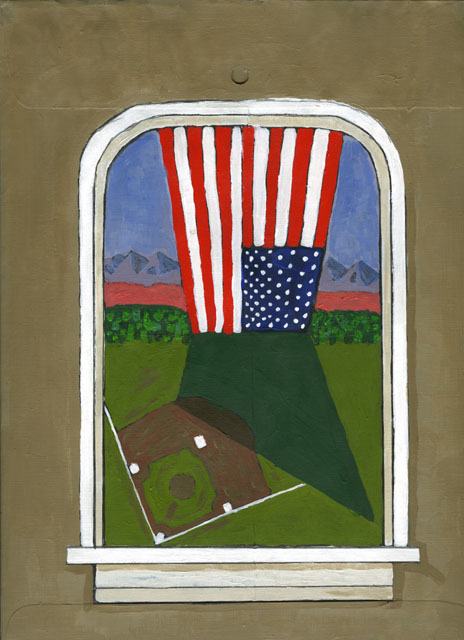 Level Playing Field Out The Window, acrylic on paper envelope, by: F.D. Zigler. There is no such thing as a level playing field - everybody is after every bit they can get their hands on - and well they should. After all, if they don't grab it first, somebody else will. We live in a country where we are supposed to govern ourselves. There is no King. No firm hand in control. We are left to trust this system left to us by those who originally had that firm hand, but gave it up to allow their posterity to live 'free'. The problem is, that by distributing power and control as widely as they did, they never foresaw the aggregation of power into the hands of the few - they built in no safeguards to prevent it from happening. Money rules this country now. If you have it, or control it, you pretty much make your own rules. Because you can. While I agree with you, I still hold out some hope that there might be enough smart people to realize that a level playing field will bring the economy back faster towards full employment, and that it will even benefit the rich to pursue the level playing field too. The question is, when everyone figures this out, will there be rioting and a revolution. I remember a successful businessman telling me one time...I don't want to change the rules...because if I ever make it to the top...I want the advantages that are currently available. If I'm ever successful I'm going to help as many people as I can. In third world countries women are getting loans to make businesses for themselves, but if you are a single mother here, you could never do that. You can get assistance only if you work some crappy job that will never pay you enough to get off of assistance. That stinks. Yes Julie, they are called micro loans and they have given women in third world countries the money to buy a sewing machine and increase their production and build a business. Bankers in this country lend to businesses and large corporations and ignore the whole micro-lending thing. Your idea to do it here in the USA would lift many women out of poverty.